A pulse wave is a special non-periodic waveform that typically has one major crest. In some cases, when it is accompanied by several minor sub-harmonic crests, where it is called a wave packet. A pulse wave is often associated with a single sudden motion, impact, or even explosion. It usually has a sinusoidal shape, but in electronics there are also square and rectangular pulse waves. As with other waveforms, a pulse has a velocity and amplitude. Since there is primarily only one crest, there is no frequency or true wavelength, although the width of the pulse relates to wavelength. What are the types of pulse waves? 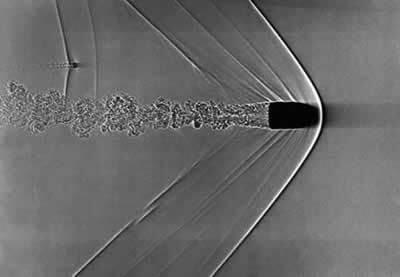 What is an example of a shock wave? As with regular waveforms, pulse waves can be compression or transverse. An example of a simple crest pulse wave is seen at sporting events where groups of fans stand up and then sit down, creating the effect of a "wave" moving across the stadium. It is a transverse waveform. A compression or longitudinal pulse wave can be seen with a slinky toy. When the pulse wave has sub-harmonic crests, it is called a wave packet. 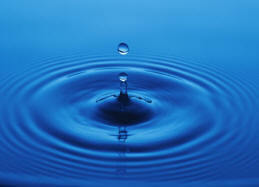 A drop of water into a pool creates the initial pulse wave, accompanied by a series of smaller wavelets. A special types of pulse wave is a shock wave. When an aircraft travels faster than the speed of sound, it is preceded by a shock wave form of a pulse wave. The same is true with a bullet. The noise from an explosion, as well as thunder, is also a form of shock wave. A pulse wave is a special non-periodic waveform that typically has one major crest. When accompanied by several minor sub-harmonic crests, it is called a wave packet. A pulse wave is often associated with a single sudden motion, impact, or even explosion.